From 2016 to 2017, we found top news apps increased their downloads 115% and their monthly active users by 61%. In 2016, these apps were downloaded 24M times in the U.S. and 52M times in 2017. *It’s important to know that when we say “news apps,” we specifically targeted actual news sources. This means organizations which hire reporters and deliver journalism. We did not include certain apps you can find in the News category of the app stores such as Twitter, Reddit and Flipboard. We also wanted to understand the split between iOS users and Android users. It was not as big as one might have guessed. Looking at the current MAU of these apps, there was a difference of less than 0.5% in favor of iOS users. CNN and Fox News are by far the most successful news apps we analyzed. 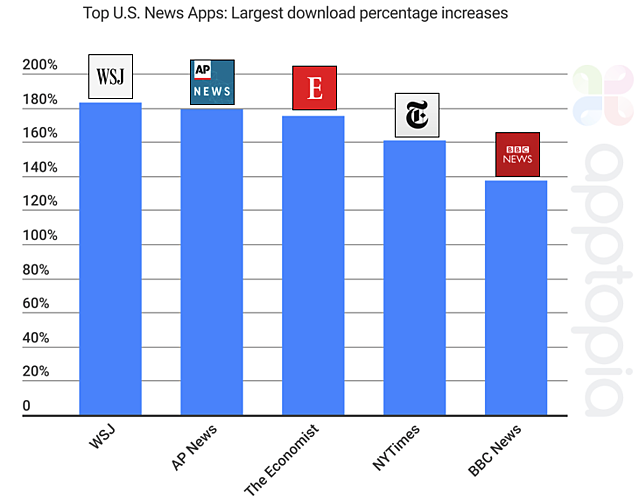 The dropoff in both downloads and MAU after these two is larger than any other dropoff we found when reviewing the top 50 apps in the News categories on both app stores.